We present delicious Eclairs Candy for our clients. This Eclairs Candy has mouth watering creamy caramel shell outside and a delicious soft milk chocolate centre that blend together to give a very chewy and delicious treat. 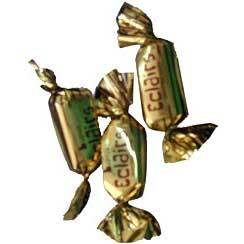 Our Eclairs Candy has right balance between hard and soft, and is chewy, smooth, creamy and chocolaty.